Stefan Latorre is the president of Latorre Law Firm. The firm specializes in the aggressive representation of individuals in both state and federal courts in personal injury, workers’ compensation, criminal defense, and immigration matters. The firm has offices in throughout the Carolinas and in Jacksonville, Florida. Mr. Latorre earned his Juris Doctorate degree with honors from the Florida State College of Law in 1991 and a Masters in Tax Law from the University of Florida in 1992. He began his legal career as an international tax attorney in Miami, Florida, and helped U.S. companies establish business operations in over 20 foreign countries. In 1996, Mr. Latorre founded Latorre Law Firm and dedicated himself to representing injured individuals and immigrants with their litigation needs. Since then, Mr. Latorre has devoted his law practice to ensuring his clients receive every benefit available regardless of their economic situation. Mr. Latorre has successfully represented over 20,000 individuals throughout the Carolinas and Florida. He has successfully argued and represented client before the North Carolina Industrial Commission, District and Superior Courts in North Carolina and South Carolina, the North Carolina Court of Appeals, and the North Carolina Supreme Court. Among the many cases he successfully argued, Mr. Latorre is most proud of two seminal cases in North Carolina. In the case of Francisco Ruiz v. Belk Masonry, the North Carolina Court of Appeals upheld the Full Commission’s decision to award workers’ compensation benefits to an undocumented worker who presented false documentation to obtain his employment. At the time, it was not clear in North Carolina whether an undocumented worker was entitled to workers’ compensation benefits. After five years of litigation, the North Carolina Supreme Court denied review of the Court of Appeals’ decision, forcing the insurance company to pay Mr. Ruiz the full value of this claim. This case made it possible for undocumented injured workers to receive workers’ compensation benefits in North Carolina. Mr. Latorre also successfully argued the case of Vicente Acosta v. Edwin Painting, where the Full Commission determined for the first time that an injured worker who could not speak English was entitled to a paid interpreter for all medical appointments. Prior to this case, insurance companies refused to provide interpreters for injured workers who did not speak English, thus depriving them of the ability to communicate with their doctors and obtaining proper medical treatment. As a result of this case, injured workers now receive the assistance of professional interpreters at their medical appointments. Mr. Latorre has helped thousands of immigrants obtain their lawful permanent resident status and naturalization in the United States. He has also successfully represented hundreds of immigrant clients in removal proceedings and obtained lawful permanent residence for many of his clients on the verge of being deported from the United States. 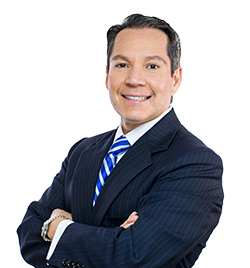 Mr. Latorre is licensed in the States of Florida and North Carolina. He is a member of the North Carolina and Florida Bar Associations, the North Carolina Advocates for Justice, the American Association for Justice, the Mecklenburg County Bar Association, the Mecklenburg County Trial Lawyers Association, and the American Immigration Lawyers Association. Mr. Latorre has written several articles in national and local publications. He has been featured in many publications and has been a frequent guest on live audio programs in English and Spanish, including Nation Public Radio. He has received several awards including the Business Journal’s “40 under 40” top business persons, the Charlotte Center City Partners’ Vision Award, and the Excellent Award as the Outstanding Businessman of the Year. Mr. Latorre is also the host of “La Verdad De La Ley” a Spanish Language radio show that is broadcast in four states. Through his show, Mr. Latorre has provided free legal advice to thousands of his daily listeners. Mr. Latorre was instrumental in the development of the restaurant and entertainment scene in downtown Charlotte. He transformed two historic buildings in downtown Charlotte and opened several restaurants and nightclubs. In 1999, he opened the first upscale Latin American Restaurant in a former mill and turned it into a lively Latin restaurant and nightclub. The restaurant received many awards for its unique cuisine and décor. A few years later, Mr. Latorre purchased and restored the building next door and opened Menage, Charlotte’s first upscale nightclub. Menage, introduced Charlotte to VIP tables, bottle service, go-go dancers, and featured a three-story indoor-slide for its guests. Mr. Latorre received the “Vision Award” for his work in creating his concepts in Charlotte. Mr. Latorre firmly believes in giving back to his community. He has represented numerous clients without charge and actively supports numerous charitable and nonprofit organizations. He has served on the board of directors of Charlotte Center City Partners, Theater Charlotte, McColl Center for Visual Arts, Discovery Place, and the Latin Chamber of Commerce. Mr. Latorre is a regular contributor to numerous organizations including the Make-A-Wish Foundation, the Arts and Science Council, The March of Dimes, Historic Charlotte, The Latin American Women’s Association, Theater Charlotte, Discovery Place, The North Carolina Dance Theatre, The Children’s Law Center, United Way, the UNCC Athletic Foundation, and the Florida State College of Law. Mr. Latorre was the chair of the Immigrant Integration Task Force which was created in November 2013 by the Charlotte City Council as an inter-agency effort intended to evaluate and recommend ways to maximize immigrants’ economic and civic contributions to the city of Charlotte. The 29 members of the Task Force presented their recommendations to the City Council in February 2015. As a result of the Task Force’ recommendations, the City Manager create and hired an International and Integration Manager that is currently working to implement many of the recommendations of the Task Force.